← Going to Berlin: Train vs Plane? Valentines Day Special – the perfect romantic Hot-Spot! 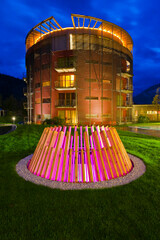 Hotel Gams in Bezau, Vorarlberg is the romantic hotspot for some special days with your partner. This hotel was built around the idea to give couples a perfect time out from the daily hassles. I have a lot of friends, who visited it once with their girlfriend (or wife) and now they have to go back there over and over again, as their partner believes this to be the perfect present. I visited Hotel Gams two years ago with my then girlfriend (now wife) and we had some excellent days. After receiving a welcome drink, we were shown our romantic suite – it had a lot of space, a feature fire place, and it was spacious. The spa area of the hotel was my favorite place – it is buried into the ground and offers everything I could ask for. Hotel Gams also offers delicious food (15 points, 2 hauben in Gault Millau) with an excellent choice of Austrian and international top-wines. The building itself consists of the original Hotel Gams, build in a very traditional way, and a modern extension, in which the Suites are located (called Blütenschloss). Over all the hotel offers, what it promises – a perfect place for couples, who want to find a break out from busy daily life and enjoy some very special days. If you are still looking for a very special Valentine present or you want to surprise your partner with something very special, you should definitely have a look at this romantic place. Homepage Hotel Gams – click here!